In the last few days, I’ve had a few projects come up that could have been interesting to develop on the IPhone. 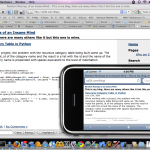 When the IPhone first came out, I signed up as a developer but never downloaded the SDK. 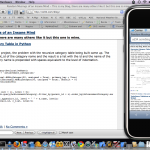 Today, I took the time to download the SDK to test the emulator for the recent template design for this blog to see how it displayed on the IPhone. 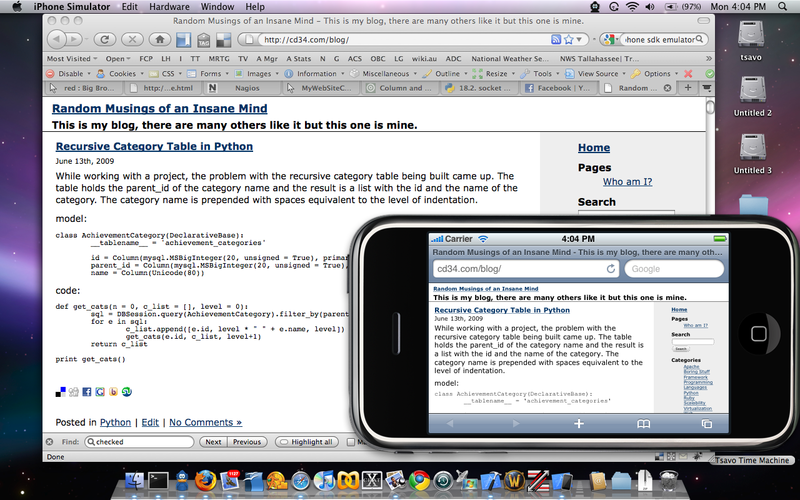 The framework appears to support Python, Perl, Cocoa and Ruby as well as native C.
Here are two screenshots of this blog on the IPhone emulator. Open up Xcode, File, New Project, Select Application underneath the IPhone Application, click Utility Application, Choose, enter a project name. After a few seconds a project window will show up with the default of Simulator – 2.2.1 | Debug. 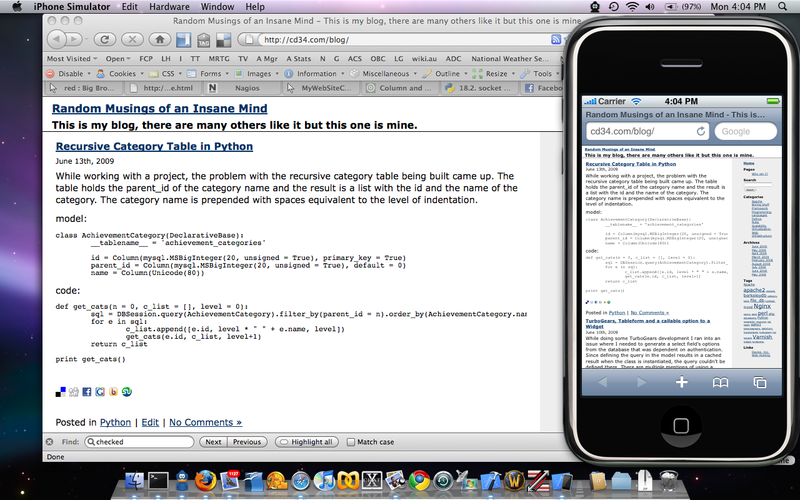 Click Build and Go and it will compile the test project and open the IPhone emulator. Click the power button at the bottom, to bring up the main menu which will show Photos, Settings, and your test application with Contacts and Safari icons at the bottom. If you open Safari, you can key in a url or use one of the existing bookmarks. Command-left arrow or Command-right arrow will rotate the screen from Portrait to Landscape and back. You can also use the Hardware Menu and Rotate Left/Rotate Right. Ages ago we had a system that used MySQL’s built in DES3 encryption. It made coding applications in multiple languages easy because we could send it a string with a key and it would be encoded in the database. It wasn’t secure if someone got hold of the code and the database, but, rather than use a hash, we could store things and get the plaintext back if we needed it. Due to some policy issues with Debian, DES3 encryption was removed from MySQL and we were faced with converting that data to another format. We chose RSA for the fact that it was supported in every language we were currently developing in — Perl, PHP and C, and we knew it was supported in Python even though we hadn’t started development with Python at the time. However, due to issues with PHP and long key lengths (at the time the code was written), our payloads had to be broken into packets smaller than the smallest key length which was 256 bytes. Since we didn’t know if we would run into similar issues using a longer packet length even if we had a longer key, we opted to use a packet size smaller than the smallest key we could generate. Our code initially converted data using PHP, stored the data in MySQL, and allowed a Perl script to access the data. Getting Perl and PHP to cooperate was somewhat difficult until we dug into PHP’s source code to see just how they were handling RSA. There is nothing really that restricts you from encrypting a message longer than the key size, but, if the message contains enough data, portions of the key can be discovered. Since the key is a very large prime number, exposing a portion of that key can be vital to decrypting the data. Perl has very powerful capabilities for dealing with structures. PHP’s support of those structures was based on Perl’s wisdom. Python went a different direction. For a communications package written in perl that communicates with 32 bit and 64 bit machines that may not share the same endian structure. The problem I’ve run into now is that Python does not support the Perl method, and, I don’t know why they didn’t at least offer some compatibility. pack and unpack give enormous power to communication systems between machines and their support of the perl methods allowed for reasonable interoperability between the two platforms. Python on the other hand opted to not support some of the features, which was one issue, but, their requirement is that you cannot send variable length packets. However, there is no method to support a variable length payload behind that value. We’re able to set a fixed length like 5s, but, this means that we’ve got to know the length of the payload being sent. If we overstate the size of the field, Python is more than happy to tell us that the payload length doesn’t match the length of the data. The cheeseshop/pypi seems to show no suitable alternative which brings up a quandry. For this particular solution, I’ll write a wrapper function to do the heavy lifting on the two unpack strings I need to deal with and then I’ll debate pulling the perl unpack/pack routines out of the perl source and wrapping it into an .egg, possibly for distribution. File_DB lacked decent file locking and concurrence. I wasn’t really willing to move to MySQL which would have solved the problem, but, added a few minor inconveniences along the way. I needed to store a few thousand bytes for a number of seconds. While File_DB was wrapped with file locking and assisted by my own lock routine, it lacked truly concurrent access which I felt was leading to some of the issues we were seeing. However, after a relatively painless conversion from File_DB to BerkeleyDB, it did not solve the problem completely. The error I was addressing is now much harder to get to occur in normal use, but, I am able to reproduce it with a small test script. The documentation for the perl methods to access BerkeleyDB are a bit sparse for setting up CDB, but, after digging through the documentation, and a few examples on the net, I ended up with some code that did indeed work consistently. Since CDB isn’t documented very well, I ended up with the following script to test file locking and ensure things worked as expected. Path issues caused most of the issues as did previous tests not actually clearing out the _db* and filt.db file. One test got CDB working, I modified a few things and didn’t realize I had actually broken CDB creation because the other files were still present. Once I moved the script to another location, it failed to work. A few quick modifications and I was back in business. Perhaps this will save someone a few minutes of time debugging BerkeleyDB and Perl. Due to a logic error in the way I handled deletions to work around the fact that BerkeleyDB doesn’t allow you to delete a single record when you have a duplicate key, my code didn’t work properly in production. After diagnosing that and fixing it with a little bit of code, 125 successive tests resulted in 100% completion. I’ve pushed it to a few machines and will monitor it, but, I do believe that BerkeleyDB fixed the issues I was having with File_DB. An application I wrote long ago that used File_DB for short-term persistent multithreaded storage had a few issues with concurrency. I debated rewriting the script to use BerkeleyDB which included proper file locking, but, decided to use Sqlite3 instead as it was closer to SQL and would eliminate a bit of code. The transition was relatively easy. Writing self-test functions worked well and a few bugs were dealt with along the way. Most of the issues were getting used to Sqlite3’s quirks, but, all in all the code worked fine. Multiple tests with multiple terminal windows resulted in everything working as expected including locking tables, concurrency issues and removing a logic error on the prior application. First startup of the application resulted in a rather strange result which didn’t make a lot of sense. I chalked that up to something I had done during testing, deleted the sqlite3 database file and restarted the application. I checked and doublechecked my code with perl running in strict mode and could find nothing that would cause this. It seems that the packaged version of sqlite3 in debian’s packaged perl is not compiled with threading enabled. I missed that when I was digging through the library configs and will have to build that package for testing. I did want to avoid using the BerkeleyDB library and move to Sqlite3, but, I think in the interest of finishing this project a little sooner, I will rewrite the code and adjust the locking and use Sqlite3 in the future. Sqlite3 works very well with SQLAlchemy and TurboGears, but, in this case, it didn’t quite solve the problem that I needed solved.